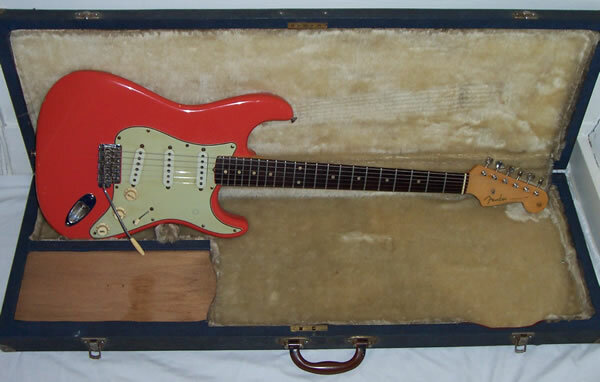 This beautiful, largely original Fender Stratocaster was originally owned (we were told) by Stan Webb of ‘Chicken Shack’ fame, who used it along with his Gibson Les Paul’s through the 60’s/70’s and possibly 80’s. 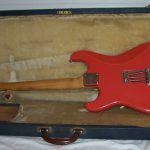 It was professionally refinished to a lovely Selmer/Fiesta red in the late 70’s early 80’s (again the date we were given), and displays the lovely patina and cracking that occurs on these vintage instruments with age. 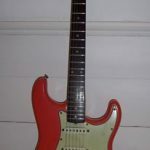 In order to verify the history we contacted Stan Webb and he confirmed that he owned two pre-CBS Strats, one in Fiesta Red that he traded in 1965, the other in a Brown wood or Sunburst (he thinks) re-finish which had a toggle switch fitted, he used that one at the Pop Proms in the Albert Hall and later sold it on to Robert Plant. 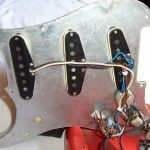 Either one could be this guitar, but it is most likely the Brown wood/Sunburst finish which later went on to be re-finished again to Fiesta Red, and would also tie in with the addition of a toggle switch. 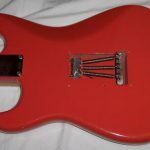 It was bought by its last owner in 1997 from Phil Harris, a Kent-based Christies vintage guitar consultant and very well known vintage guitar hire company owner (http://www.harris-hire.co.uk/) who has both hired to and maintained instruments for Mark Knopfler among other artists. 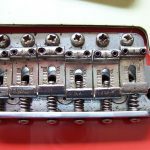 Phil writes a monthly column on vintage guitars in Guitar and Bass Magazine, and has provided the history of the guitar up until this point. The guitar was hired and used on many recording projects on the London A-list recording scene in the 90’s, and is a wonderful collector’s piece as well as player’s guitar, having a particularly twangy vintage bridge pickup tone and smooth neck pickup from its original black bottom pickups. Since 1997, it has only ever been set up and serviced by Tom Mates of Bermondsey, London, Eric Clapton’s legendary guitar technician and luthier. 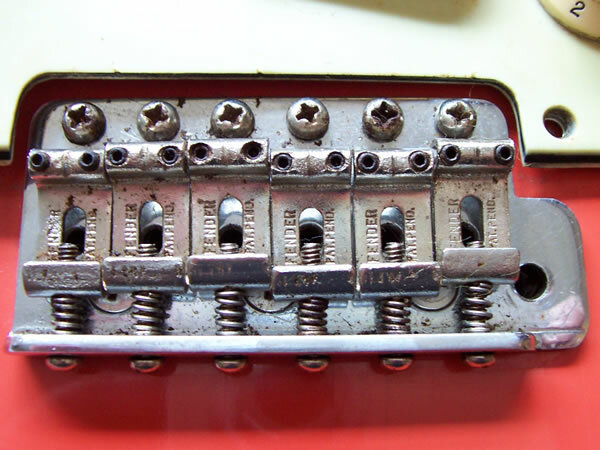 The following is an inventory of what we believe to be original and non-original parts, and other essential information about this Stratocaster Serial Number – 50304 printed on the bottom of the neck plate (as per historical accuracy for some instruments in 1959-60). 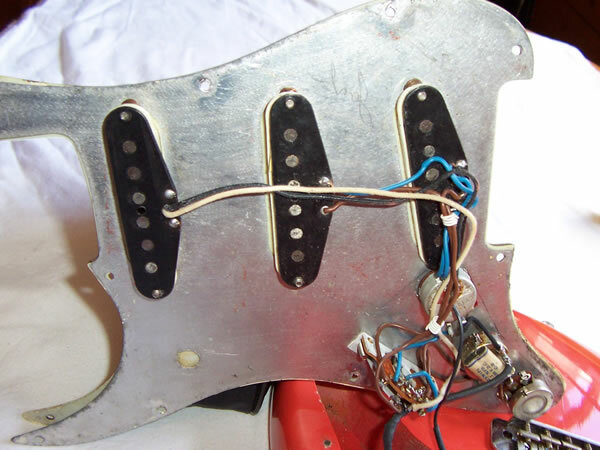 Body, Neck, Green guard and foil insulation underneath, bridge, pickups, jack plate, tone and volume controls, string tree, tremolo bar, neck plate, switch tip, two x pots no: 304-5946 (dates 46th week of 1959). 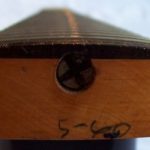 some frets are possibly original, the fret bottoms do not break through the rosewood slab board and were fitted sideways into the fret slots rather than hammered from above. 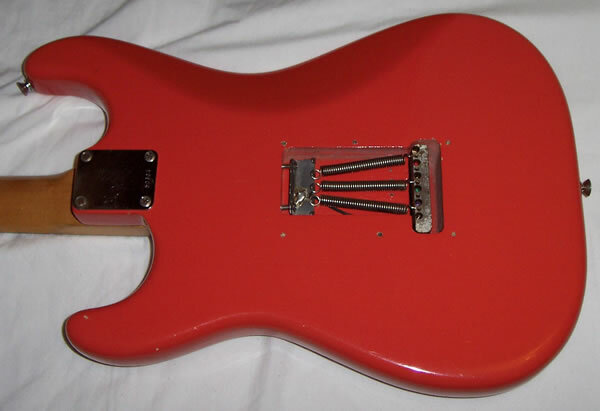 Re-finish from possibly (slight signs in body cavities) Brown or Sunburst. Date: (we were told) Late 1970’s – early 1980’s?. Kluson tuners vintage re-issues, Fender decal, neck re-finish, 1x pot and some wires, three way switch. 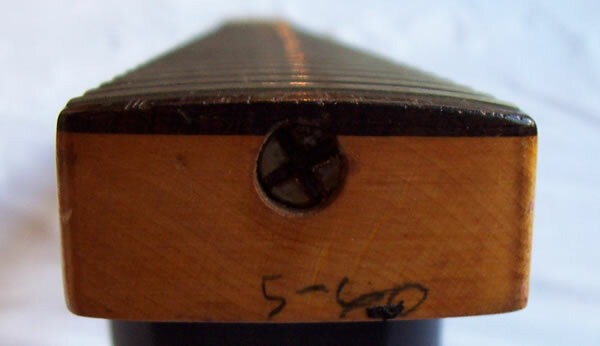 It is believed that a parallel or boost toggle switch was fitted to the guitar in the 60’s/70’s evidenced by a small (8mm or so) restored circular hole where the piece of green guard has been kept and replaced and this looks entirely unobtrusive and in no way affects the playability of the instrument. The guitar sounds rich, partly from the rosewood neck, which somewhat darkens and adds complexity to the tone. 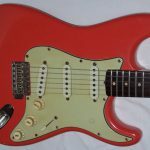 These guitars do not sound like modern day Stratocasters; they have a vibrancy, age and up front sound which is different to the reissues or replicas. When I recently compared this to a USA made 1960 specific reissue, I was surprised at how different they sounded! 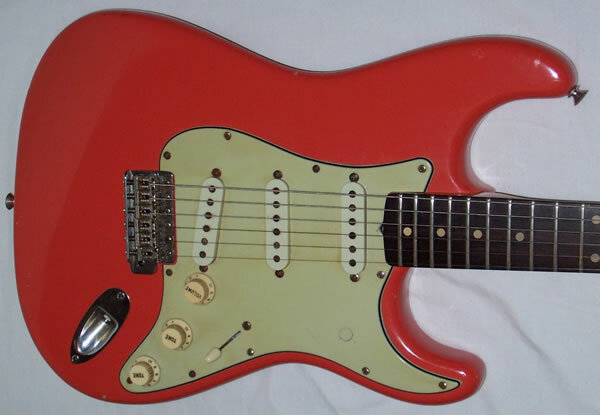 Modern Stratocasters have all the ‘classic’ twangs, smoothness and out of phase sounds, but they all sound similar! This guitar sounds vintage, and its out of phase sounds are deeply lovely, and the outrageous twang of the bridge pickup is much more aggressive and biting than any modern Stratocaster. The neck is an extremely thin D which is a well known phenomenon on Stratocaster guitars throughout 1959-60. They became more baseball bat shaped in 1962, and this guitar has none of that feel, having instead a lovely, narrow, fast playing D shape which would suit any style. This has what is believed to be the original ‘home-built-for-the-British-Market’ case, though I have no authenticity for this. It is a heavy 1960’s blue vinyl covered case with white fur lining and compartment. 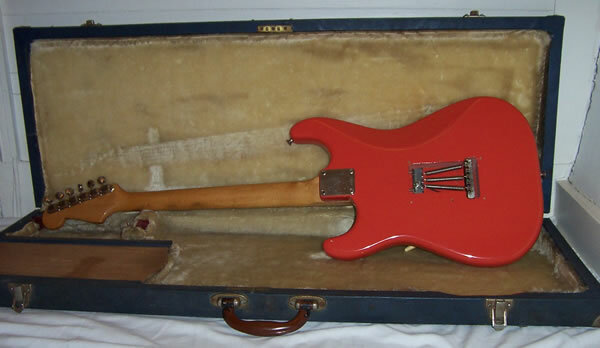 The guitar is also supplied with a Hiscox Stratocaster case. Our asking price is considerably lower than the market value. Our Special Price Only £7000.00 – This Item Has Now Been Sold.